The bull is grazing at the hay pen by the barn at a farm in the Mennonite Heritage Village. A farm is part of the Mennonite Heritage Village. This farm has a bull grazing at the hay pen. The pen sits near the barn at the farm. A red barn sits in the distance of the pen. 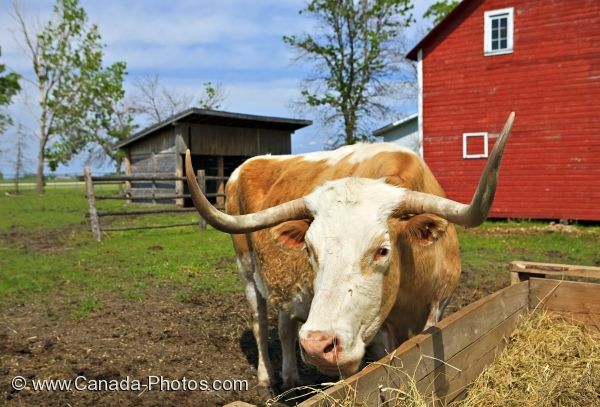 Bull grazing on hay in a pen beside the Farm Barn at the Mennonite Heritage Village, Steinbach, Manitoba, Canada. Please make sure to see our photo gallery Canada animals with more creatures from Canada. This large bull enjoys his meal as he grazes at the pen full of hay by the farm's barn.